The Renault Fuego’s story has already been told in these pages but a brief recap is in order. Introduced across Europe in 1980 as the successor to the 15 and the 17 coupes, the Fuego was built using a cocktail of 18 and 20/30 parts installed in a futuristic, wedge-shaped body. Its large glass hatch earned it the unfavorable reputation of being a poor man’s Porsche 924. The Fuego was off to a good start but sales started dropping two years after its introduction as market preferences shifted from coupes to hot hatches. 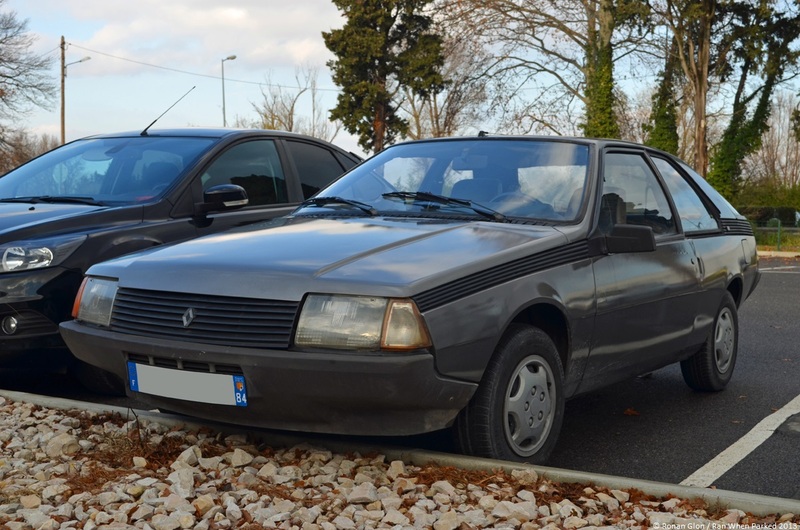 In spite of being offered with a potent turbocharged four-cylinder and host of high-tech equipment including an on-board computer, a multi-function steering wheel and remote keyless entry, the Fuego filed to woo buyers until it was phased out in Europe in 1986. Over thirty years after its debut, the Fuego is an uncommon sight that is almost exclusively sought-after by die-hard Renault fans so we were speechless when we walked out of a mundane furniture store in a strip mall and found ourselves face-to-face with a first-gen GTL model. The plates (blocked out here as a courtesy to the owner) were issued earlier this year and are not original so it is difficult to tell when the car was first registered, but it was built between 1980 and 1983, when the facelifted model was introduced. We did not manage to find the owner but a walk around the Fuego revealed it is has undergone some bodywork covered up by a low-quality paint job in the not-too-distant past. Some of the lights are faded and its 13-inch steel wheels are covered by awful, supermarket-spec hubcaps but the mere fact that it exists and it’s out an about running errands is amazing in itself. Website howmanyleft.co.uk claims there are just 26 Fuegos left in the United Kingdom and not a single one is a GTL model. The story is not much brighter in the Fuego’s home country of France, where government statistics indicate only 472 Fuegos are left on the road. The Fuego GTL pictured below was a mid-range model positioned a step-up from the entry-level TL but below the GTS, TX, Automatic and GTX variant. It was powered by a carbureted 1.4-liter four-cylinder engine that was an evolution of the Cléon-Fonte mill introduced in 1962 and bolted in the engine bay of a wide array of Renaults including the 4, the 5, the 8, the Le Car and even the first-gen Twingo. For use in the Fuego GTL, it was tuned to send 64 horsepower to the front wheels via a four-speed manual transmission but a five-speed unit was available at an extra cost. In 1982, the Fuego GTL cost 56,000 francs while a base-model Volkswagen Scirocco CL retailed for 51,990 francs. To help explain why buyers gradually shifted from coupes to hot hatches, that same year a 110-horsepower Renault 5 Alpine Turbo (sold as the Gordini Turbo in the U.K.) sold for 56,800 francs and a 105-horsepower Fiat Ritmo 105TC carried a base price of 51,550 francs. While they were undoubtedly not as comfortable at high speeds or on long trips, rising fuel prices and declining speed limits made having fun at low speeds more important than being able to cruise all-out for hours on end.